Photo: Pablo Martinez Monsivais (AP); Screenshot: The Dark Knight Rises (Warner Bros.
To follow the doings of Donald Trump even briefly is to be constantly bombarded with a stream of indignities, breaches of protocol, reality-warping lies, and extended middle fingers, ranging from the petty (his staff photoshopping him to look thinner) to the outrageous (brazen efforts to make our cruel health care system even crueler). Something that definitely falls in the small-potatoes camp: On Tuesday, Trump’s Twitter account posted a bizarre montage video intended to serve as a trailer of sorts for his 2020 re-election campaign. It is the “Fish Delight” of campaign videos, topped off a grotesque amount of secret sauce in the form of a ripped Hans Zimmer track, “Why Do We Fall,” from the 2012 Batman film The Dark Knight Rises. Hans Zimmer did not immediately respond to a request for comment from Gizmodo. In the movie, the song plays while Bruce Wayne escapes from a prison called “The Pit,” which is never really explained in any capacity beyond being ambiguously foreign and scary. Very apropos! In Trump’s version, it plays amid intertitles reading “First they ignore you / Then they laugh at you / Then they call you racist / Donald J. Trump / Your vote / Proved them all wrong.” Also Bryan Cranston and Amy Schumer are there for some reason. North Korean dictator Kim Jong Un makes a brief appearance, but not as the antagonist. It should be noted that while Wayne is forced to vigorously train to break free of “The Pit,” the president reportedly believes that exercise drains precious life energy from the body and that not doing it will make him live longer. 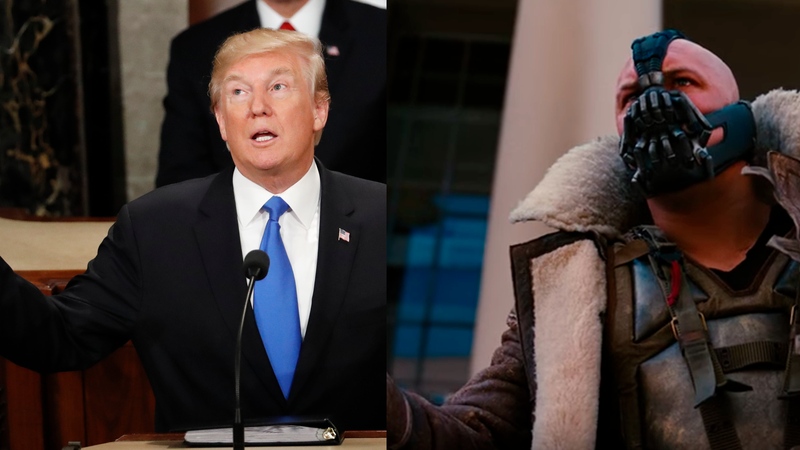 Last year, HBO warned the Trump administration to stop using Game of Thrones-style memes to promote sanctions on Iran. He later ignored that warning and brought a printed-out version to a meeting on border security to promote sanctions on... It’s not really clear, as more sanctions on Iran had already been passed by that point. While HBO appears to have let the matter go, in February 2019, Twitter took down a separate video post to Trump’s feed featuring the song “Everybody Hurts” at R.E.M.’s request. Seeing as the president has already proved he is not immune to DMCA takedowns, there’s no reason to suspect this situation will end any differently. Update: 4/10/2019: Aaaaaaaaand it’s gone.